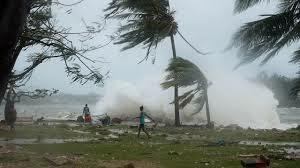 The authorities in Mozambique say the death toll from Cyclone Idai in the country's central region has risen to 68, with the figure for those injured surpassing 1000, APA can report. State Radio Mozambique quotes the governor of the central province of Sfala Alberto Mondlane as saying the deaths are mainly due to the collapse of homes and other infrastructure and drowning. "Preliminary data indicate that so far 68 people died from the diluge and 1,300 others seriously injured" Mondlane told Radio Mozambique on Sunday. The city of Beira, one of the largest in the country with half a million inhabitants, was hit the hardest by the cyclone and at its central hospital received hundreds of people who have been assisted since Thursday night. The provincial capital is partially destroyed and it is still without electricity from the public grid and communications are limited. The same scenario occurs in other parts of the province, hindering relief operations. The victim count is yet to be completed, as there are places which are difficult to reach due to rising river levels. On Thursday and Friday Mozambique saw the second largest storm of the cyclone season which, with wind speeds as high as 224 kilometres per hour that were accompanied by heavy rain, uprooted trees and destroyed infrastructure such as power lines, houses, roads and bridges as it swept through the port city of Beira heading inland to the provinces of Zambezia and Tete. The United Nations estimates that there are now 600,000 people affected in central and northern Mozambique, whether they have been left homeless, without food or other property, or with no access to farmland and basic services. More than a third of the affected population is made of children, estimates the United Nations Children’s Fund (UNICEF). The main problems for humanitarian assistance of various entities on the ground include the difficulty in reestablishing communications and access to the affected areas.